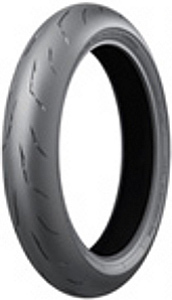 Tame both the roads and the racetrack with these ultra-high-performance sports radials. Forged whilst competing in the worlds leading racing series and adpated for street use, the Battlax RS10 gives you the confidence to get the most out of your machine. So good, the RS10 is chosen as OE on many of the latest and leading sport bikes. If its good enough for the motorcycle manufacturers. The Battlax RS10's new-formula compounds and re-engineered tread deliver outstanding braking stability, line-holding precision and steering response. Feel the exhilaration of winding roads and G-force-inducing racetracks thanks to stable braking into - and faster acceleration out of - every corner. Enhanced traction on both the front and rear tyre* delivers true high-speed stability and control for faster lap times on the track and more thrills off it. Significantly improved dry braking, acceleration and handling let you test the limits of both you and your bike.